Daniel Ballinger's FishOfPrey.com: LINQ To SQL - "String must be exactly one character long.."
I used LINQ to SQL to throw together a quick data access layer to a third party database. In theory in will only be a temporary measure. System.FormatException: String must be exactly one character long.. 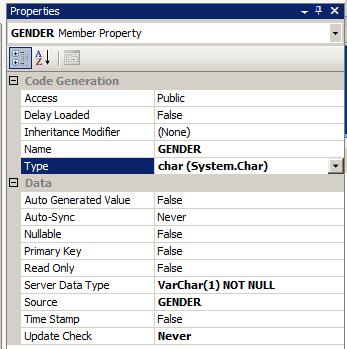 Turns out the issue is related to a VarChar(1) NOT NULL column on the table. The Code Generation has interpreted this as char (System.Char). Changing this to string (System.String) got the system going again. There is some risk now of assigning a value longer than one charater but I can live with that for a temporary solution.